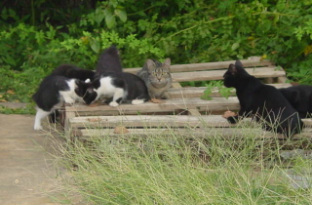 We are looking for barns to relocate feral/semi feral cats within a reasonable drive from the Fredericksburg, VA area. They will require shelter, such as a barn, outbuilding, igloo under a porch, or access into a garage, and daily nutritious cat food and fresh water. We prefer that 2-3 cats familiar with each other be relocated together. In return they will provide you with an ecological way of rodent control. All of our barn cats are fully vetted and they are FREE!!! If you know of someone with a mouse problem, please refer them to us. If you're interested in adopting cats for your farm, please take a moment to watch the video on the left. We love to educate the public about how to incorporate a new cat into an unfamiliar environment in order to ensure the transition goes smoothly. Thanks to Shelter Me for providing such an informative video. Be sure to check out their website for more information on their rescue group in the Boston area.